Illia Ivanko put on the most intense ARDF training camp in the US ever. We had 12 events over 16 days at 7 venues. That was 6 Classics, 2 FoxOring, and 5 Sprint events. (One day we had 2 sprint courses.) We had 6 new people try the sport and a couple of them are enthusiastic about this “new” sport. There was general agreement that Classic ARDF is more challenging, and FoxOring is a bit less challenging than Orienteering. BOK has another 4 ARDF events on the schedule this year and Patrick and Kelly have scheduled another 4 events for Kelly’s middle school. We are all planning to work together to build on the existing schedule to have at least one event per month. We have plenty of brand new high quality receivers for you to use. We will have beginners instruction at every event. Here is the week’s schedule. (Event descriptions below.) Please register for events you plan on attending. You can submit one form for multiple events if you want to plan ahead, or submit the form each time you plan to attend a single event if you want to stay flexible. If you change your plans please return and remove your registration here. Be sure to check which events you want to be removed from. Enter my Registration I can't come Remove my Registration from the checked events. Please answer the question to prove you are human. Classic 80m and 2m events consist of 5 controls. All the transmitters are on the same frequency and each transmitter turns on for 1 minute and off for 4 minutes, then the sequence repeats. To qualify you only need to get 1 transmitter, the beacon, and finish on time. Sprint course has 2 sets of 5 controls. Each set has its own frequency, and one set beeps faster. Each transmitter is on for 12 seconds and off for 48 seconds. You find one set, punch in at the beacon, get the second set and finish. The beacon has its own frequency and is on continuously. FoxOring course is a Score course, so you can take the controls in any order. Control locations are marked on the map, and the transmitter is within 50m of the the center of the circle. You orienteer to control location, however when you are about 50m from the transmitter you can hear the signal, and use your radio receiver to locate the transmitter without going to the circle location. You punch in at the transmitter, not the location on the map. (Usually there is no flag at the location marked on your map, however at this event there will be a flag at the marked location, but don’t punch in there, punch in at the transmitter. Demonstration course: Two transmitters on different frequencies are on continuously. Course length about 300m. BOK has 7 high quality 80 meter receivers to loan out at the events, so if you haven’t tried it before be sure to try it out at the Open event and then attend some of the others. Our first event was a success. We use Patrick’s transmitters and everything went off with only one tiny hitch… the beacon (the transmitter at the finish that stays on all the time) went off for a while when the antenna got disconnected accidentally. There are two types of receivers for the 80m band. The “loop” and the “ferrite rod”, and while they work the same way the loop type has a strong signal when it is held sideways, and the rod type picks up the strong signal when it is held frontways. Unfortunately Harold learned on the rod type, but was using our new loop type at the event. The unfortunate result was that while he was navigating close to the controls he kept circling the transmitter and was unable to find one. We felt terrible that he had this frustrating experience, but his spirits were still good and he is ready to try again tomorrow. Dave Waller put on a great event open orienteering event at Eno River. He set out a FoxOring course where you orienteer to a control circle on the map and then use your receiver to locate the very low power control within about 40 meters from the circle center. I am very happy to report that Harold found all the controls using our new “loop” receivers after his frustrating lesson on Saturday. We had two sets of sprints today. After everyone completed their sprint Illia moved the controls and we went out for a second sprint. On Wednesday we had an excellent 4km long 80 meter Classic Radio-O event at Schenck Forest. Afterward Illia analized our splits and routes and suggested techniques to save time and complete the course more efficiently. We had another successful 80 meter classic event at Carolina North Forest. We had our first “beginner” show up. David Waller decided to give it a try and went out with some confidence since he had made the map. After a successful run he returned within the time limit after finding one control and the finish – this is the requirement for a successful run. Typical of many ARDF events we had a technical delay to the start which resulted in the last finisher returning just at sunset and the control pickup finishing in the dark. Another problem with finishing near sunset is all the amateur radio code chatter which picks up when the propagation improves because the reflection from ionosphere picks up after sunset (and presumably Hams get home from work). The sprint at Bond Park went well and taught us (again) that sprints are hard to do in the optimum order without standing around and waiting for the signal to come back in another 48 seconds (which seems a lot longer than it is). These were very short courses so we ran them a second time to correct our original mistakes. We had perfect weather and a 6 new people showed up for their very first Radio-O course and 6 regulars came as well for a record setting 12 people at one of our training events. 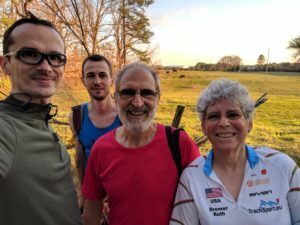 Patrick’s transmitters worked flawlessly throughout the event, and Joseph used his new 20′ pole to set the beacon antenna. With all the teaching and talking we didn’t finish up until 4pm. The most satisfying part of the event was that everyone found all the Foxes including Justin and Dave who first tried ARDF (Radio-O) this week. We all took “raincoats” for the receivers because rain was predicted, but there were only a few sprinkles. We got wetter from sweat than rain. We had a wet Classic event at Bond Park. The rain let up for a little while, and then got going again. While Dave and Imre had to remove their glasses because of total fogging, Joseph’s anti fog fan hat successfully kept his glasses clear. The course was unique because the start and finish were in the middle of the map. (They are usually at the edge or corner of a map to minimise the effect of the “exclusion zone”. Back at Bond Park we had a full Sprint. The weather was cool and windy. Again we started in the middle, so the foxes were all around us, making for various good route choice. The wind blew some of our antennas over so over the course of the event some of the transmitters showed no direction at all which made for some frustration. Unfortunately technical glitches are part of the sport, and need to be taken in stride. Illia also set up two transmitters in the 2 meter band for everyone to try out. We are going to need more practice to build enthusiasm for this band. Our FoxOring piggybacked on the BOK Open event at Umstead North. We had a remote start and used a subset of the Green and Red courses. Three people found all the transmitters, the problem was when Dave was picking them up. One of the transmitters in his pack turned on accidentally while he was locating the last fox making it impossible to locate using the receiver. He didn’t give up, but used a brute force search pattern from the flag to finally find it.